(NaturalNews) Millions of prohibitionist-minded Americans have been exposed as complete hypocrites by research proving that refined sugar is more addictive than even hard drugs like cocaine. A compilation of scientific evaluations looking at both sugar and synthetic sweeteners reveals that these omnipresent substances often trigger the same or stronger responses in the brain as illegal drugs, and are sometimes much harder to break in terms of habitual consumption. A paper published in the journal PLOS ONE back in 2007, for instance, explains how rats given the option to choose between drinking water sweetened with saccharin (Sweet'n Low) or intravenous cocaine almost always chose the water. A shocking 94 percent of rats, according to the researchers, actually preferred the high that they got from saccharin as opposed to the cocaine rush. The same study found that sucrose, or common table sugar, was also preferred by the rats over cocaine. Based on this observance, the research team noted that regardless of caloric content, the sheer intensity and pleasure of sweetness seems to be more addictive than even the sensitization and intoxication brought about by cocaine, which mainstream society still recognizes as being much more harmful than sugar. 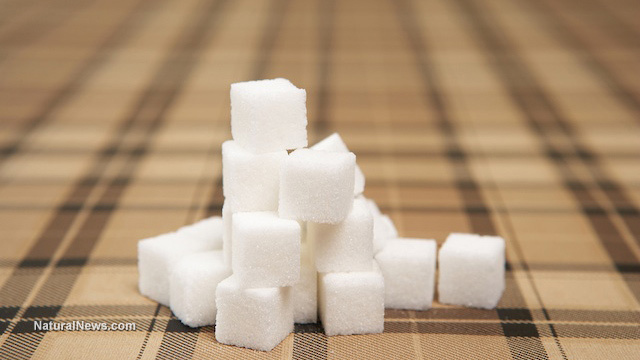 "Refined sugars (e.g., sucrose, fructose) were absent in the diet of most people until very recently in human history," wrote the researchers from University of Bordeaux in France and James Cook University in Australia. "Today overconsumption of diets rich in sugars contributes together with other factors to drive the current obesity epidemic." But is it just that the taste of sweetness is enjoyable, or is there something more going on in the brain to indicate actual dependency and addiction? Nearly 40 years ago, William Dufty helped answer this question when he penned a book entitled Sugar Blues, which highlighted the addictive properties of sugar and how sweets are a major driver for declining public health. Many of the ideas presented in this groundbreaking book have been affirmed and reaffirmed by science, which has repeatedly demonstrated that certain neuroendocrine pathways are activated in response to sugar. The infamous "sweet tooth" and frequent sugar cravings are indicative of how these pathways drive obsessive consumption and addiction. "In most mammals, including rats and humans, sweet receptors evolved in ancestral environments poor in sugars and are thus not adapted to high concentrations of sweet tastants," wrote the author of another study involving bees, which experienced cocaine-withdrawal-type symptoms when their sweet floral resources were taken away from them. "The supranormal stimulation of these receptors by sugar-rich diets, such as those now widely available in modern societies, would generate a supranormal reward signal in the brain, with the potential to override self-control mechanisms and thus to lead to addiction." Wheat and processed milk are similarly addictive, according to GreenMedInfo, which documents how many processed foods made from these additives possess narcotic properties, acting in a similar way to heroin when consumed. Modern wheat actually contains psychoactive chemicals that bind to opioid receptors in the nervous system, literally acting as a drug inside the body. Wheat contains a variety of opioid peptides known as gluten exorphins, while cow's milk contains a variety of casomorphin peptides. Both of these component classes are highly addictive, and are part of the reason why foods made with them are often referred to as "comfort" foods. "Fructose... is known to increase brain levels of endogenous morphine following ingestion, and may produce metabolic products in the brain very similar to those produced by morphine," wrote Sayer Ji for GreenMedInfo about another highly addictive food additive prevalent in the American food supply.